Artist - "The Most Famous Lips in the World"
Please provide us with a two sentence overview of yourself. I get to create art for a living. I work in many different mediums, clay, oils, acrylic, charcoal, textiles, metal....but since 2001 my main focus has been on lipstick. I use lipstick in lieu of paint and my lips are my paintbrush. I love taking things from everyday life and using them in ways that they weren't intended. What age and year were you diagnosed? I was diagnosed in 2000 at age 18. What type of insulin pump do you use? Give us a fun fact about yourself! I've tried other pumps before, and Animas® is by far my favorite. Also, it's waterproof and PINK. Why do you like painting? I get to create for a living! Working at home is the best. I get to spend all day with my awesome husband, our dog, Etta James, and our four cats, Sir Isaac Newton, Charles Mingus, Twiggy and Esther Williams. 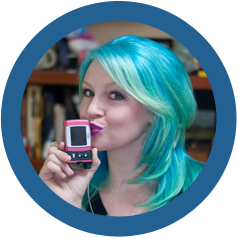 What was your life like before an insulin pump? A rollercoaster...not the fun kind. What are the main challenges with living with type 1 diabetes? It's a stressful disease that doesn't react well to stress. The biggest challenge is vigilance; you never get a break from this disease. What advice would you give to others your age, who are newly diagnosed with type 1 diabetes? "Managing" type 1 diabetes is difficult. You are essentially trying to make up for an organ in your body that doesn't work. Some days you get everything right and you feel invincible, but some days you don't, and it's not your fault. There are a lot of factors involved in blood glucose regulation, and some of those things are simply not in our control, and that's OKAY.